average-mph had the most liked content! I have a standard 18’ x 9’ garage and my Evora fits in no problem, I can also get in and out😊. Hi Kurt, my car is a GT410 Sport and for me it’s just as much fun as the Exige V6 but a lot easier to get in and out of. Don’t get me wrong if Me and the wife was younger we’d probably have an Exige 410 or 430 and still go on track days. The 400 is not ugly, it’s just a matter of taste. 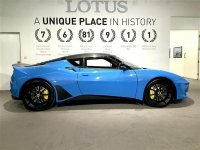 I’ve owned all the Evora’s except the GT430 and I have no complaints. Ponded on the V8 Vantage but just not as enjoyable as the Evora and I would not consider an R8, nice looking car but not British. Phil you are a perfectionist, I say no more. Lead acid batteries are pretty much all the same, they have a limited life span. When buying one you need to get from a supplier that has a good stock turn over, you don't want one that as been sitting around for a few months. Halfords is a good buy, but if you want a brand then Varta and Exide are also good. You could also go Lithium Ion but they are expensive. I’d like to take part in this, especially the Indian part.